Water managers run into two major issues when customizing best management practices (BMPs) for local farmers: (1) they must consider variations in climate, topography, soil characteristics, crop type, etc. and (2) they must spend a considerable amount of time learning and calibrating water management models to test various BMP scenarios. To overcome these difficulties, Cornell University and Idaho State University have teamed up to incorporate nitrogen, phosphorus, and pesticide transport algorithms into the Watershed Erosion Prediction Project (WEPP) model (link to USDA WEPP site). The goal of this project is to provide water managers with an easy-to-use online tool that can accurately predict hydrological processes, sediment loss, and contamination transport for a variety of landscapes, climates, and cropping scenarios. 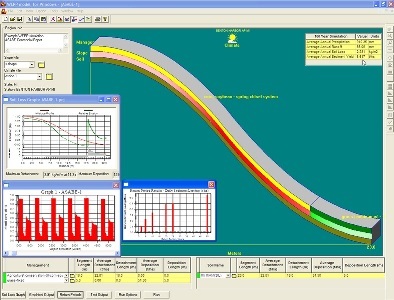 Additionally, water managers can use this tool to determine the ideal landscape placement for BMPs. Denitrification, the microbially-mediated process by which nitrate is converted to nitrogenous gases, may be an important sink of anthropogenic nitrogen (N) in eastern US watersheds. Actual rates of denitrification, however, have been difficult to quantify and remain one of the critical unresolved N processes at the landscape scale. This project focuses on improving our understanding of the spatiotemporal distribution of denitrification in an agricultural landscape, in hopes of improving our strategies for controlling N loading to streams and rivers. During the period from 2008 to 2010, we quantified denitrification using the push-pull technique (Addy et al. 2002) at Cornell's Harford Teaching & Research farm, at a range of locations from upslope to riparian. We also used the detailed information available on N inputs and outputs at the farm to construct an N balance. Preliminary results are supporting our hypothesis that most denitrification occurs over a relatively small portion of the landscape and correlates with those areas prone to saturating. This has important management implications since agricultural lands are often intentionally drained, removing these biogeochemical hotspots. Reference: Addy, K., D.Q. Kellogg, A.J. Gold, P.M. Groffman, G. Ferendo, C. Sawyer. 2002. In situ push-pull method to determine ground water denitrification in riparian zones. Journal of Environmental Quality 31 (3): 1017-1024. Building off other lab research on spatial controls on denitrification, this project seeks to focus in on the occurence of this important biogeochemical process in stream riparian areas. Due to their varying moisture conditions and availability of carbon sources for microbes, riparian zones can be hotspots for biogeochemical transformations. Especially in agricultural landscapes where runoff may be high in nitrate, riparian areas may be protected as a 'buffer' to intercept and help remove or transform some of these incoming nutrients. This practice of establishing riparian buffers would be most useful if we could better choose riparian areas prone to high rates of denitrification, which would remove N in runoff from its soluble nitrate form. 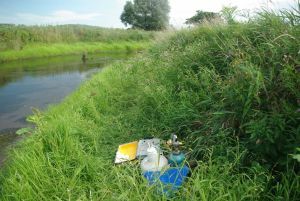 We are currently using the push-pull technique (referenced above) to quantify denitrification in multiple locations near an agricultural stream, in conjunction with measurements of various dissolved consituents in incoming groundwater as well as soil and landscape geomorphic characteristics. The linkage between riparian vegetation and stream water quality is well established, although many of the process-level interactions are still poorly understood. Many studies have shown that sudden removal of trees increases summer nitrogen concentrations in stream, presumably due to the decreased nitrogen uptake. Because of the interactions between riparian trees and stream nitrogen concentrations, the recent confirmation of Emerald Ash Borers (EAB) in the Hudson River watershed may have important consequences on water quality. The primary goal of this project is to establish monitoring sites and collaborations with other researchers in advance of the almost certain loss of riparian ash trees in response to EAB invasion. We are monitoring soil, water, and vegetation across a gradient of ash covers in order to make some initial assessments about any general correlations between ash and water quality. More importantly, this project will provide the baseline data needed to assess the impacts of EAB on riparian vegetation composition and water quality. Soil and Water Lab people working on this project: Lauren McPhillips, Brian Buchanan, Liz Kreitinger, Meghan Fitzgerald.